Bog-myrtle is not easily confused with other wild plants on this web site. 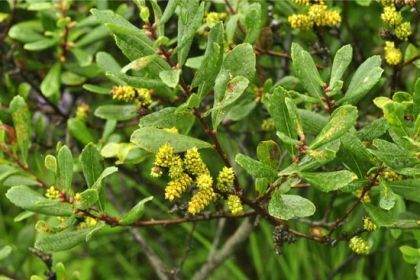 A real West-of-Ireland shrub, Bog-myrtle loves acid soil, lake shores and bogland. In impenetrable little thickets, it grows to about 1 metre tall, having red-brown, twiggy stems. From April to May, little catkins grow – orange and red, on different plants; the male (orange) are each 15mm long with 4 stamens, the female (red) only 6mm long. 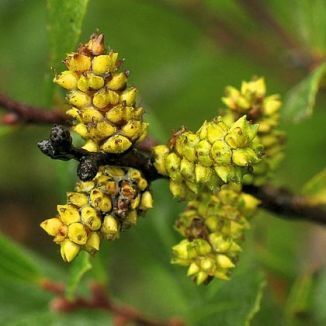 The oval to lanceolate leaves are downy below, almost hairless, and a distinctive fragrance of resin emanates from them and from small yellow dots which grow on the branches. This is a native plant and it belongs to the Myricaceae family.